Before club, palce four buckets full of water at one end of the room and four empty buckets at the other end. 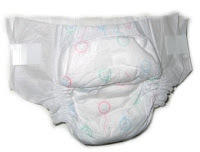 Have kids form four equal groups, and give one large disposable diaper to each group. Have one member from each group wait at the opposite end of the room by his or her group's empty bucket. At the signal, the first person in each line must soak a diaper with water, then trasport the diaper on his or her head, the the empty bucket at the other side of the room. Once they reach the empty bucket guard to squeeze the water from the diaper into the bucket - using only their heads. When the diaper is empty, each member runs back to his her line, and then the process repeats itself. Instruct groups to keep playing until time is up. Measure how much water each group got into the originally empty bucket.